What strings do I use on my Taylor Electro Acoustic guitar? I really like these stings, their sound, their feel, their responsiveness but mostly the nice balanced clear and night after night consistent tone they generate. I can see why Taylor, who make some really good sounding and playing guitars, recommend and deliver their guitars strung up with Elixirs. I got my Taylor in Utah and it was strung with Martin Strings which were OK.
and the highs just stay and sustain for months. I have also been trying these D'Addarios on my Parker Fly. 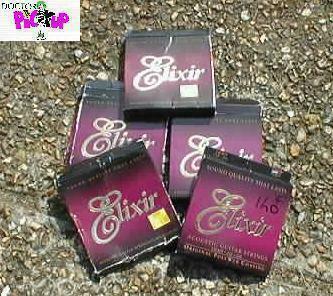 They were OK.
Now I am using Exilir Strings and on the Parker Fly they are ideal. The Parker Fly guitar sounds great with the electric signal going through the Full Drive and Déja Vibe and the acoustic signal going direct to the band's Soundcraft sound desk. 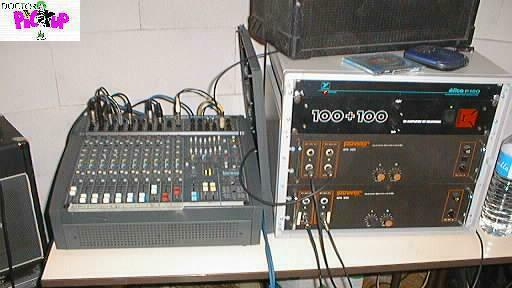 Another variation I should try is the acoustic signal through the Deja Vibe and the Electric through the Full Drive II to the Soundcraft sound desk. 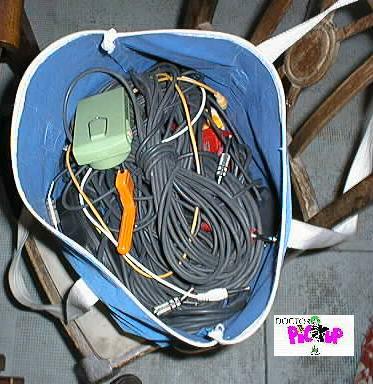 I just use the first setting in rehearsals, on stage I go wireless with a mono signal into the Soundcraft or a guiatr amplifier and use the controls on the Parker fly to mix the electric and acoustic signals. For those of you who read Vintage Guitar I thought the Gigmeisters latest articles (April May 2002) on going amp less were interesting as we have gone through the same through the same thing. I also have D'Addarios on my ES 335 and Tom Anderson Hollow T.
I find them a bit brighter than Ernie Ball, they are OK as substitutes. Robert Pionner, the other original Dr Pickup guitarist swore and stills swears by D'Addarios. Also my friend Sebastien of Lead guitars is rather partial to D'Addarios. 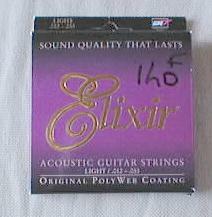 Taylor recommends Elixir strings for their acoustics and Tom Anderson recommend Elixirs for their electrics. On the strength of that I decided to check them out. 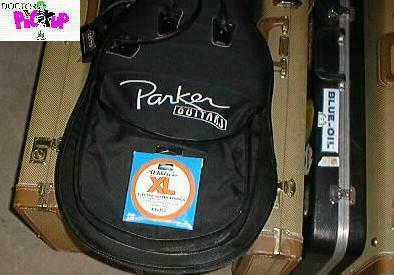 These guitar strings are coated in a Goretex finish and are more expensive than regular guitar strings. They are not easy to get in France, one can't buy them individually and they cost a lot more than regular strings. 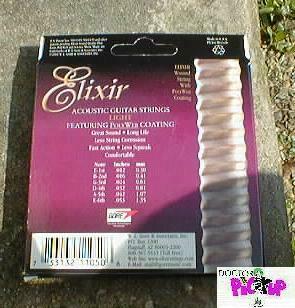 The dudes in guitar shops, the ones that don't have Elixir strings in stock will go to great lengths to tell you the extra you have to pay isn't worth it. When they say that I KNOW they have never tried these strings on a good acoustic or electric guitar. Since trying them on my Taylor I have not used any other strings. My acoustic stage partner Stirling wasn't too enthusiastic about the cost and the initial feel of Elixirs. Now they are the only strings he uses on his Taylor 815, already a great sounding guitar but even sweeter with these strings. They sound great - feel a little funny for the first five minutes - intonate and sustain well and they are long lasting. People are always asking ' Wow that guitar sounds great - did you just restring it?'. I find a heavily played set can last three months. So even though they cost three times more than other strings they last three times longer and sound better the whole way through. Now I have the Electric Elixirs on the Parker Fly it sounds even clearer and sweeter. Now I just have to find some one to sell me Elixirs in bulk for both Acoustic and Electric guitars.